I was walking uphill wondering what sticks, what's in a name, why do they change, does the landscape care, who are the caretakers of a place-name? We might just be flecks of mica flashing briefly on a sun-struck pebble in the streams, but names are important to us in our brief mappings of our landscapes. Our human territories are marked by names, sign-postings, marker boulders, paths and cairns, amongst other structures, both textual and physical. 'The Cobbler' mountain - Arrochar's finest and most distinctive peak - is a curious example of the fluidity of naming the landscape; of confusion, habit, fashion, politics, class, and misinformation. The confusion starts even with the parish name of Arrochar. 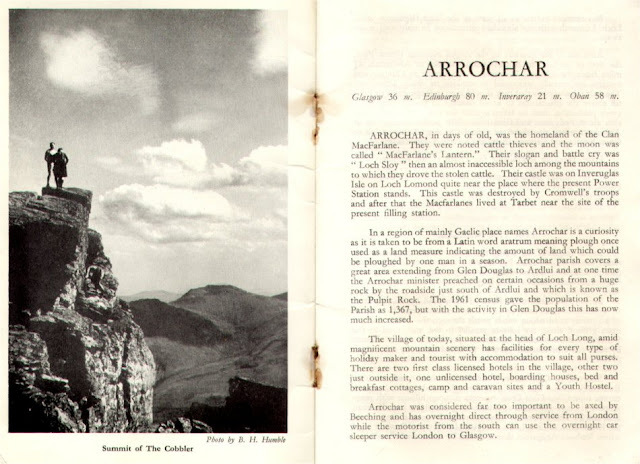 Ben Humble, in his his 1960 pamphlet Arrochar and District: A Complete Guide, states that "...Arrochar is a curiosity as it is taken to be from a Latin term aratrum meaning plough once used as a land measure indicating the amount of land which could be ploughed by one man in a season." This gives a clue, but isn't quite correct. Would the Britons and Gaels have adopted such a foreign Latin term, would they not have had their own? It doesn't sound like the modern day 'Arrochar' which has a Gaelic guttural roll which seems a stretch from the clean syllables of 'aratrum'. This sounds more like a Chinese whisper. 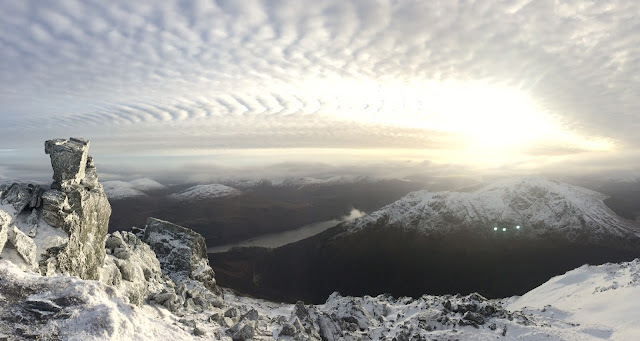 Other online sources say 'Arrochar' derives from the Gaelic 'Ard tir', meaning the high land, or the land on the East. Intriguing, but not quite there. A better hypothesis is that it derives from the Gaelic 'arachor', which was the name for an old Scottish measurement for an area of land measuring 104 acres. The old English term 'acre' is also aurally close (as a measure of tillable land), and closer still is the Old Norse 'Akr'. The Vikings certainly knew the area, having portaged their ships from Loch Long to Loch Lomond on a raiding party during King Hakon's doomed war campaign which ended at Largs in 1263. Possibly, at a stretch, the old Latin 'aratrum' could be obscurely linked to the later anglicisation of Ben Arthur (another name for The Cobbler), but this is probably a fantasy. Geoffrey Barrow, renowned Scottish medieval scholar, notes in 2003: “Lennox is well-known to have been the home of the arachor, a word fittingly preserved in the name of the village of Arrochar ... Like carucate, arachor has an obvious etymological connection with ploughing, and the texts leave no doubt that arachor was in fact a Gaelic term for ploughgate.” Barrow notes other examples that arachor was a Gaelic term for ploughing, quoting, "three quarters of land of Akeacloy nether, which in Scotch is called Arachor". It sounds very close to the Old Norse Akr, or the Germaninc Aecer (acre of land). An t-Àrar or An Tairbeart Iar - this 2003 source (Mac an Tàilleir) says: “The English and first Gaelic names are obscure but may be related to the name, Ben Arthur. The second Gaelic name is “the west isthmus", comparing it to Tarbert on Loch Lomond.” A closer glottal Anglicization from the Gaelic might thus make sense: An t-Àrar as an ellipsis of An Tairbeart Iar, but likely more closely is the derivation from from An t-Àrchar (the ploughing/sowing place), which makes topographical sense due to the flat acres of fertile land squeezed in at the bottom of Glen Loin. So to The Cobbler, which has been named Ben Arthur on generations of OS maps. Ben Arthur seems naturally to be an Anglicization from an older 'Ben an t-Àrar' (Hill of the western isthmus) which might have been favoured by English-speaking cartographers. Timothy Pont, who misheard many names on his travels (being a Reformation scholar and very much a non-Gaelic speaker) favours Àrchair: his c. 1591 Pont map 17 gives Suy archire, which could be Suidhe Àrchair (Arthur's Seat?). To get to 'Arthur' we must look to a 1926 source (Watson), who in a naturally post-Romantic period believed it was Beinn Artair, after King Arthur, a figure always wistfully linked to the Highlands. Ben Arthur may also have come from Beinn artaich, (stony mountain), via the same route of English ears hearing the romantic name 'Arthur' in place of 'Artaich'. The Cobbler has become more popular in the 20th century due to the natural Last-like features of this horned mountain. 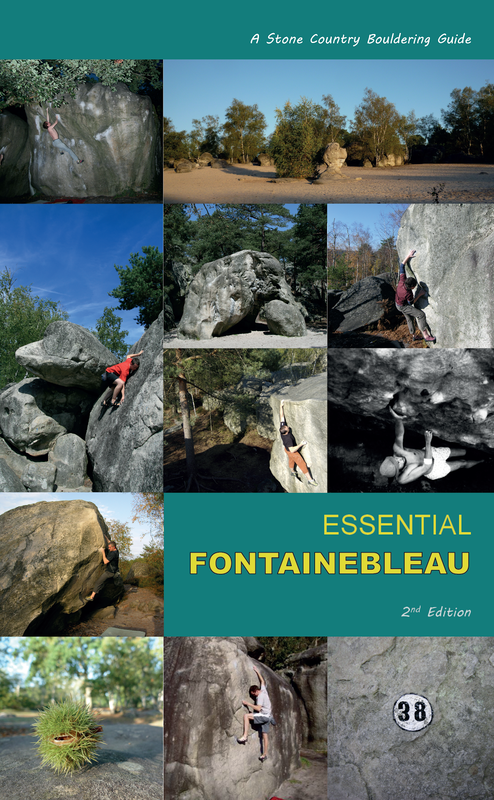 And popular names, in a popular era of tourism and hill-walking, tend to stick, with publishers, map-makers and tourist companies favouring a feature-based mentality to touring (such as Denecourt's 19th century rock-featured trails in the forest of Fontainebleau). The Cobbler may also possibly come from gobhlach, meaning forked, with English pronouncing the plosive 'b' sound (a bit like hearing 'cobbla'). But this would assume a written source on an early map being misconstrued and transmogrified, for in Gaelic speech 'gobhlach' is a lot softer. In a text ‘Local Scenery and Manners’ by John Stoddart (1800) he states that the local people called the peak ‘an greasaiche crom’, ('the crooked cobbler'), and today’s name is thus just a translation. In reality our toponymical mental map is a palimpsest of Chinese-whispers, half-understood local languages, oral history transmutations, cartography assumptions and the popularity of ruling classes as the landscape is renamed not by those who live there, but by those who come to represent it, especially in the globalised world of landscape and its literature. A local Gaelic farmer who would never have traveled far, nor had the need to, had no other requirement than to be obvious about the landscape in a local sense. Hence the popularity of the name Ben Mor ('the big hill') in Scotland. Why would he have had the need to call a hill anything other than what was relevant to the everyday? King Arthur would have meant little to him as a mythology. History is the silent traveling companion of any mountaineer. 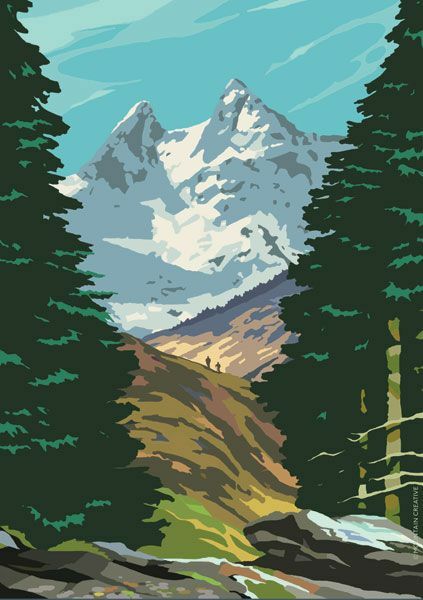 The thematic thrust of this major work – as the back cover copy suggests – is that a knowledge of history and landscape enhances our climbing experience. Indeed, it is necessary to appreciate this fourth dimension as grounding for a longer-term sense of place and deeper satisfaction of our sport. Climbing in Scotland follows a deep palimpsest of visitation as climbers since the middle of the 19th century have traced each other’s steps on vertical ground, deviating only where the technology allowed deviation. Difficulty is always relative, but the landscape is the same, the challenge always present. There is one thread between us, and a hungering urge for return and revisit. This book looks to the first hunger pangs. The initial chapters guide us through the transition from landscape and geology as necessitous bounds of life and politics (bird fouling on St Kilda; General Wade's military mapping) to the possibility of landscape as recreation (Forbes, Raeburn and their ilk). This transition largely occurred in tandem with the Victorian penchant for tourism (inspired by Walter Scott and other romantic authors) and via academia and Natural History (geology expeditions and birding trips, such as Raeburn's climb with bird fowler 'Long Peter' on Shetland in 1890). This broader landscape history is detailed in classic works such as Ian Mitchell's Scotland's Mountains Before the Mountaineers (Luath, 2004), and in the lavish production of Chris Fleet's Mapping the Nation (Birlinn, 2011), but Crocket here gives us some rediscovered historical gems from the climbing literature, such as Raeburn's account of Long Peter's rock-climbing skills (and bold attitude) on the Lyra Skerry. It reads as though Long Peter is exhibiting to Raeburn an enjoyable athletic skill he has cultivated, focusing down on the exposed moves on the 'bad bits', with the aim of collecting eggs somewhat incidental to the immediate difficulties. Eggs are apt metaphors for what is about to develop. The period 1866 to 1886 sees a nascent exploration of the steep cliffs in the highest ranges, largely in Skye, frequented by the likes of William Naismith and of course the dynamic duo of Norman Collie and John Morton Mackenzie in a golden era of exploration on the gabbro walls of the Cuillins. There are some interesting technical asides on alpenstocks and a fascinating portrayal of that old stalwart – the 100 foot hemp rope – as an illusory piece of protection. It is remarkable to think that these climbers, in clumping hobnails, found the delicacy of approach and toe-touch to negotiate difficult ground for around 80 years as effectively solo ascents, with nothing but a psychological umbilical threaded between them. Sometimes it was window-sash cord. The mini-biography of Collie contained within these chapters is told with fondness and the astonishment of a modern climber at the underestimation of the achievements of these early explorers. Collie finished off the intricate mapping of the Cuillin Ridge peaks and bealachs when the OS had only managed 8 measurements. His life-long relationship with JM MacKenzie is one of a friendship bound in landscape through time, and immortalised in it with their names suitably Gaelicised on neighbouring peaks of the Cuillin, echoing the twin headstones side by side in Struan graveyard. The writing does well here to take the reader beyond the catalogue of ascents and climbs towards the character and style of the two great climbers, and captures the refreshing thrust of youth finding in the world novelty and thrill rather than relativity and memory (we tend to imagine Collie and MacKenzie as grizzled old guides moping around the Slig Hotel). It is to be commended that the volume looks at the wider context of landscape and politics, as quite naturally the arena for climbing is set in what were effectively 'private' estates in the Highlands, with land access and rights for walking becoming a particular and newsworthy feature from the Victorian era onwards. This mostly urban leisure coterie suddenly found itself encountering the entrenched enclosure mentality of landowners that crofters and Highlanders had been suffering for centuries. These access wars included the Glen Tilt botany expedition of 1847 and led to legal action and to the Scottish Rights of Way Society – notably a group able both to afford legal representation and co-ordinate their resistance without fear of eviction or worse. James Bryce, a Glasgow-born Liberal MP, was foremost in representing this movement as far as Parliament in the Access to Mountains (Scotland) Bill of 1894. It would be 2003 before this statutory revolution would win through against feudal landownership as the Land Reform (Scotland) Act and modern climbers should do well to realise their now-enshrined rights were born of other centuries. This era of curiosity in all things high and steep (largely 1866 to 1914 in this book) mirrored a wider social mobility and of course greater economic capability and leisure. This led to much professional occupancy in the Highlands with meteorologists, botanists, surveyors and the like, and was accompanied by the rapid growth of mountaineering societies trying to emulate the Alpine Club enthusiasm for high peaks. The Cairngorm Club was founded in 1889, followed shortly by the Scottish Mountaineering Club, the birth of which was induced by the Glasgow-based William Naismith, who published appeals for such a society in the Glasgow Herald. Its initial roll-call consisted of academic professors, baronets, doctors, lawyers, reverends, businessmen etc. and it would be notable that a separate Glasgow-based club (The Creagh Dhu) would later arise from the working class as a reaction perhaps to the discomfiture of climbing next to a wealthier class of mountaineer. But these were not men and women bred to exclusion and Mason-like enclosure. Crocket points out here the greater social benefit of these clubs (aside from keeping the wealthy amused), such as the ancillary activities of recording their tradition in journals and area guides (the SMC Journal first appeared in January 1890), organically spreading experience, technology development and skills-based knowledge to a wider audience of potential mountaineers. These days we often underestimate the difficulty of actually sourcing and spreading knowledge in pre-internet days, when people valued face-to-face meets as essential knowledge-dumps or social Googling. Local newspapers, limited guidebooks and young club journals were the only repositories available for climbers to spread their enthusiasm to the wider population, and the author interestingly points out the absence of listing mountaineering as a 'sport' in Thorstein Veblen's sociology text The Theory of the Leisure Class, published in 1899. Mountaineering, it seemed, would always fall outside the pale of public consciousness and was still very much the privately documented leisure of the wealthy (at least until access, technology and skills became cheaper and more public after the wars of the early 20th century). It is an odd irony that the first SMC journals, entertaining snow-globes of those early mountaineering moments, can now be read online by thousands more people than were ever first read on publication. The recording and diarising impulses of these early pioneers is now digitally embedded (thanks to such print and electronic publishing efforts by the SMT) and consequently gives us a longer perspective than the fading legacies of oral history, or indeed total silence on the matter. With the publication of ‘Hugh Munro's Tables of Scottish Mountains’ in 1891, along with completion of the Fortwilliam rail-route in 1894, technological and industrial expansion would transform the mountaineering pursuits. Rock-climbing, rather than a nascent Munro-bagging, as the author notes, was the natural challenge for the club climbers, many who were prepared to walk huge distances to ascend climbs, compared these days to often only a maximum ‘two hours from the car-park’. The author reproduces some of the key documentaries of ascents in this era from the journals: epic rounds of Munros; appalling gully assaults such as the infamous Black Shoot; as well as the early fascination with Cir Mhor’s NE Face in the 1890s, where today we mirror this adventure with the technical stealth-smearing on the blank slabs on the southern flanks of the Rosetta Pinnacle (then beyond the capability of boot technology). In fact, the whole book feels like this: a kind of mirror image of technical and wondrous ascents on unknown rock territory (in tweeds and hobnails rather than Pertex and rubber), with the appalling watershed of WW1 separating the generations of rock climbing in Scotland. It is no underestimation to say the rock-climbing community had to evolve again from scratch, with new fascinations and technologies, and with new appetites for risk and adventure untainted by the realities of war. Ben Nevis receives its fair attention with accounts of ascents by William Inglis Clark, Harold Raeburn, even George Mallory amongst others, in the era when Ben Nevis was actually less forbidding with the shelter of the Observatory and Summit Hotel should the weather cave in (ascents often started with a ‘down and up’ climb to the hotel, rather than the modern-day ‘up and down’ to the CIC Hut). 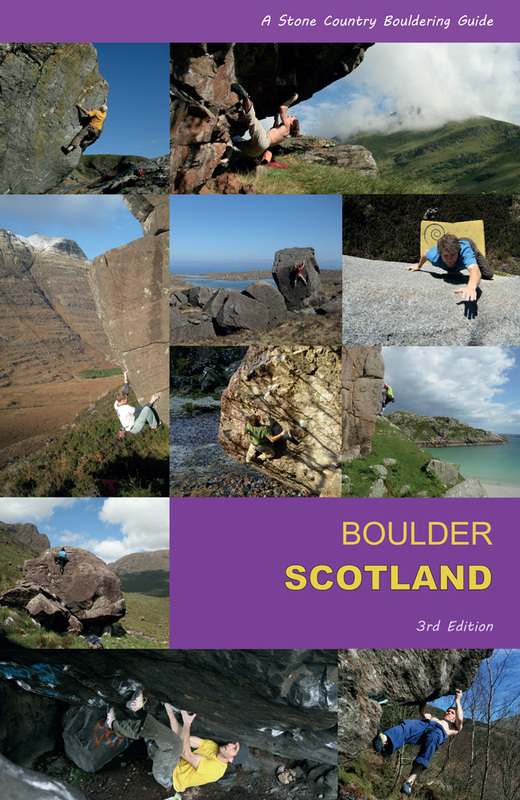 The bulk of the book recites the gradual opening of such great cliffs of Scotland, the exploration of gullies and ridges, and the gradual mental mapping of vertical areas, the names of which are often used as reference or access these days (Tower Ridge, Gardyloo Gully, Observatory Buttress etc. ), the drive to deviate and explore being what it is. Perhaps the most impressive rock ascent of the era was Raeburn’s solo summer ascent of Observatory Ridge in June 1901. This long ‘V Diff’ route still feels exposed and tricky in our modern era and shows the qualities of route-finding and composure this generation possessed. Raeburn would continue to dominate the major ascents on ‘The Ben’ with the impressive winter ascent of Green Gully in 1906, and Raeburn’s Buttress in 1908. In Skye, the first complete ascent of the Cuillin Ridge was made by Shadbolt and MacLaren in June 2011, and this seems to round off the achievements of this remarkable generation of climbers, despite their lack of awareness of what lay round the corner. The last chapter ‘The Darkness Drops’ is an aptly named epitaph for those who didn’t come back from the First World War, and marks a significant reset in the nation’s consciousness as to the purpose of going into the hills. It would be a long time before those that were left had the energy, or even the urge, to return to the hills. We should congratulate Ken Crocket on a tour-de-force of reanimation and for his dedicated enthusiasm for a lost generation of climbers, rapidly in danger of being forgotten not only by modern climbing, but by the obliviating erosion of fashions, and dare I say it, the blizzard of the digital present. Reading this terrifically detailed chronology of an era when the cliffs were largely all virgin territory, it is chastening to think that not a single climbing fatality was registered, and that the self-reliance of this generation far outweighs the blithe reliance on technology we could perhaps be accused of these days! 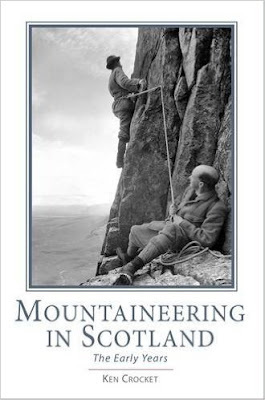 That is not to diminish modern achievements, but one of the crowning achievements of this book is that it puts in true perspective the depth of resilience and judgment these early climbers brought to the Scottish hills. The photographic plates are a highlight and I hope the SMT continues to deposit more historical photographs and documents on their website http://www.smc.org.uk/ along with their continued devotion to recording a sport and tradition which is embedded in landscape and history, and all the better for it. This wondrous book should inspire any climber in Scotland to return to old haunts, wearing a new layer of understanding and respect, a little tweedier perhaps, and maybe, briefly, without a phone signal.